The North Sea coast in the Netherlands is a beautiful area for recreation, especially for cycling. The entire coastline consists of sandy beaches. Between those beaches and the better known Dutch green landscape we find a line of sand dunes, sometimes several kilometers wide. Together the dunes and sandy beaches form a landscape that is unlike any other in the Netherlands. Most of the area is only accessible on foot or by bicycle. The dunes form a barrier to the sea and protect the land behind it that is often a lot lower than sea level. The first barrier dunes formed 7000 years ago and remnants can still be found at some places. Most of the modern dunes formed since about the year 1000 AD. The dune landscape is primarily open with some brushwood and a lot of small lakes that are often used as drinking water collectors. Sandy beaches and sand dunes stretch all along the Dutch North Sea coast line. With the public transport bike that brought me here. Recently I visited the dunes just north of The Hague, the Meijendel Dunes where famous Dutch painter Vincent van Gogh has lived in 1882-1883. Today the most important functions of that area are: nature protection, collection of drinking water, coastal defense and recreation. More than a million people visit the area every year. 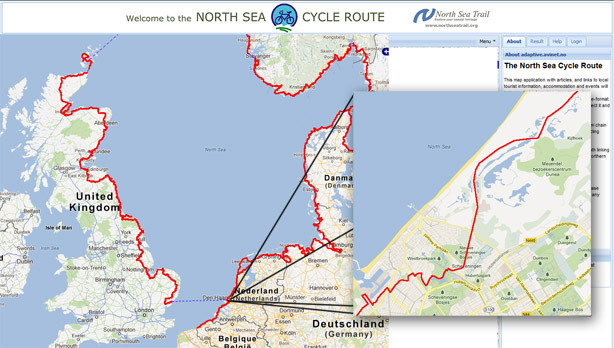 North Sea Cycle Route all around the North Sea. In the Netherlands this is the LF1 route. The excerpt shows where I cycled in the Netherlands (near The Hague). The long distance cycle route LF1, that is part of the international 6,000km (3,728m) North Sea Cycle Route, passes through this area. On a sunny Friday morning a lot of other people were on their way on bicycles. The Dutch separate traffic even on recreational routes. Left to right, foot path, cycle path and bridle path. In the distance the water tower of Scheveningen (The Hague). I cycled South to the former fisherman’s town and now seaside resort Scheveningen. That one Englishman informs us should be “pronounced by saying “shaving ’em” and simultaneously clearing your throat”. After the beautiful silence in the dunes the seaside resort is a bit too much of a carnival with all the noise and people. I rather see it as it was in 1881 and luckily that is possible! The 360 degree Panorama Mesdag is a painting 14 meters high and 120 meters in circumference. The vista of the sea, the dunes and Scheveningen village was painted by one of the most famous painters of the Hague School, Hendrik Willem Mesdag. It is the oldest 19th century panorama in the world in its original site, and a unique cultural heritage. But as the video shows, the dunes are still magnificent! We and the family also did a bike trip along the North Sea in Holland last summer. Although the weather was kinda of meeeh the beach and the dunes were absolutely fabulous, never been to such wide beaches in my entire life. 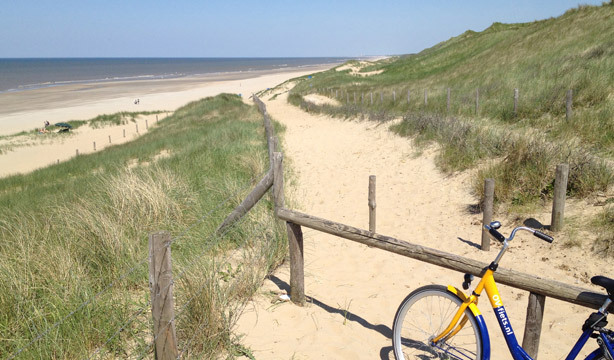 We booked the tour with http://www.hollandcycletours.com/holiday/deltaworks-and-dunes-tour/ if anyone is interested. But there are many more tours like this in the Netherlands. 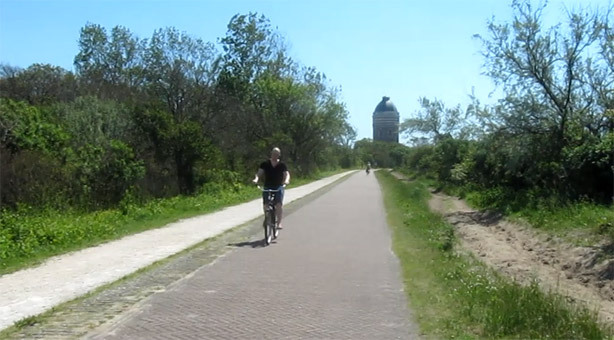 Just google “holland bike tours” as we did and you’ll find plenty! Bikes can be rented at most train stations (http://www.ns.nl/en/travellers/about-your-trip/travelling-by-train/to-and-from-the-station#by-bicycle-or-moped). We did a day trip along there last Autumn. From Duinrell to Katwijk and then back to the south end of Wassenaar. So off the top of your zoomed map and not the part your video shows I think. It was very nice though. That must have been the first day that the sun was out this year? Which websites and/or paper material do you recommend for tourists to study if they want to plan a bike trip through the Netherlands? I find there is surprisingly little in English on the web. I get requests on a regular basis here in Canada, there doesn’t seem to be a good portal or source on tourist cycling in other languages. Just plan to go where you like just like you would with a cartrip. You can cycle everywhere in the Netherlands. Lonely Planet is a good reference. This entry was posted on 24 July 2012 by Bicycle Dutch in Original posts and tagged beach, Den Haag (the Hague), North Sea, recreational cycling, Scheveningen, Summer, watching people cycling.